I'm always hearing about how things were different forty years ago... places were safer, people were kinder, weather was better. Heck, I sometimes talk about how things were better ten years ago... people were on time because they couldn't call your cell and ask you to wait for them, there was no texting so you actually had to talk to people, your friends actually carried cash so checks could split nicely. A while back I saw an episode of The Golden Girls where the girls are having a really bad Christmas Eve. They're not able to get home for the holidays and it's cold and rainy out. They wind up in a diner and they feel bad for the worker, since he's not able to spend the holiday with his family. So, since they have nothing better to do (and they're nice people), they offer to look after the diner for an hour so he could go home and be with his family for a bit. The guy hardly thinks twice before letting them take over. It starts snowing and everyone is happy in the end. You can see the scene here. Now, I could hardly believe this. It's 2011, and the episode (season 2, episode 11) originally ran in 1986. 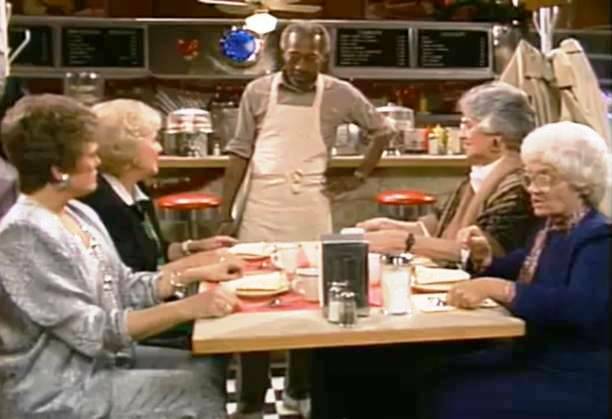 It kinda baffles me that, 25 years ago, it was cool to allow some strangers to run your diner for an hour. Maybe the guy trusted four senior citizen ladies whom he believed were all related. But, it's still Miami, and that's not St. Olaf! Maybe those older than I can comment on whether this could have actually happened... thoughts?